From 7 to 12 June 2010, the city of Leipzig, Germany, will be hosting the INTERSCHUTZ expo, the global shop window for suppliers to the nonpolice public safety sector. The fair showcases products and services for emergency and rescue organizations, technical rescue specialists, first aid providers, firefighters and first responders to chemical, biological and radiological incidents. Known as the international exhibition for rescue, fire prevention, disaster relief, safety and security, INTERSCHUTZ is held every five years and has a strong international profile, attracting exhibitors from more than 50 nations. Stephan Ph. Kühne, Deutsche Messe's Vice President in charge of INTERSCHUTZ, is pleased to announce that, with just under two months to go until the start of the expo, the exhibition halls are already completely booked out. "This year's INTERSCHUTZ is going to be considerably bigger than in 2005. So far we've received over 1,309 exhibitor registrations - that's 134 exhibitors, or about 11 percent, more than five years ago. The show's international participation rate has also increased. In fact, its commercial section will for the first time have more international exhibitors than German ones (620 vs. 578). Most of the international contingent will come from China, France, Canada, Poland and Turkey." Just as in 2005, Stephan Ph. Kühne anticipates that INTERSCHUTZ 2010 in Leipzig will attract more than 100,000 international visitors, of whom 95 percent will be emergency and rescue sector professionals, of whom, in turn, around 70 percent will be senior managers with decisive input into their organizations' capital spending decisions. "The visitor statistics will be impressive, thanks in large measure to the joint promotion campaign by the exhibitors and Deutsche Messe and the fact that the fair is staged in parallel with the 28th German Firefighting Convention." The organizers and sponsors are also confident INTERSCHUTZ will have a wider range of exhibits than ever before, not least because of the show's unique combination of commercial and noncommercial exhibitors. GFPA President Hans Jochen Blätte: "The GFPA is expecting a large number of innovations that will make working life easier for emergency and rescue professionals and improve overall job safety." Stephan Ph. Kühne is equally confident about the upcoming expo's thematic diversity: "INTERSCHUTZ will remain true to form as a tradeshow for new product and technology launches, and will feature more innovations than ever before. We are expecting growth in all display categories, particularly in the areas of technical fire protection, rescue, and personal protective equipment." With its stronger international profile and more diversified exhibition program, INTERSCHUTZ has come a long way since the days when it was an exhibition exclusively for the fire services. It is now the No. 1 international exhibition for rescue, fire prevention, disaster relief, safety and security. Stephan Ph. Kühne: "Among other things, we have achieved major growth in exhibitor numbers in the emergency and rescue sector - thanks to our expanded exhibitor promotion campaign. We've also managed to get some of the world's leading ambulance manufacturers onboard." INTERSCHUTZ also offers a wealth of knowledge networking and learning opportunities. There's the International Fire Prevention Symposium on 8 and 9 June, and the inaugural RettCon congress for rescue paramedics and emergency medical specialists on 11 and 12 June. What the future holds for firefighters will be on show in Hall 1, with an array of presentations on current research activities and projects. Stephan Ph. Kühne: "Among the more spectacular highlights at INTERSCHUTZ will be the live demonstrations on the openair site. 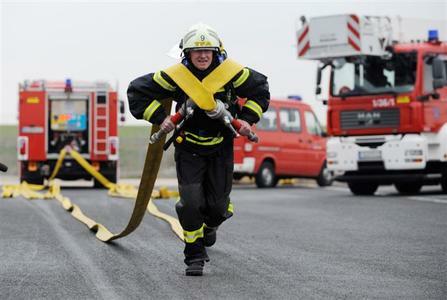 This exciting program has been put together by Deutsche Messe in partnership with the Leipzig Fire Department. This year also marks the start of our cooperation with Internet radio station Radio 112, which will be providing coverage of activities and innovations before, during and after INTERSCHUTZ."